The Biostatistics Consulting Platform in conjunction with MCHRI presents the "Challenges in the analysis of registry data". Due the longitudinal and observational nature of data collection in registries, there can be many challenges in the analysis of such data, including missing data, spatial and temporal correlation in the data. This talk will highlight some potential remedies including multiple imputation techniques and Bayesian spatio-temporal models. 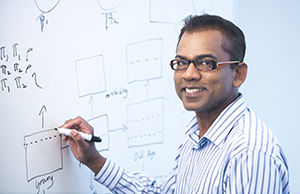 Arul is an Associate Professor with the Biostatistics Unit and senior Biostatistician with the Registry Sciences Unit in the Department of Epidemiology and Preventive Medicine. For close to 20 year, Arul has provided consultative and collaborative methodological input to various collaborators. The outcome for some of this work has been more than 125 publications in a variety of peer-reviewed international journals, including BMC Health Services Research, BMJ and JAMA. He is the author of the upcoming book “Essentials of a Successful Biostatistical Collaboration”. Arul was awarded the status of Chartered Statistician (C.Stat) by the Royal Statistical Society in London in 2003. He enjoys teaching courses on biostatistics and research methodology. Does the data in the manuscript you read appear dodgy? Ever wondered when it is appropriate to use the mean or the median? Do you want to pass the strict statistical checklists from journal/grant reviewers? This talk will highlight some of the common pitfalls in the analysis and presentation of data. Examples will be drawn from the healthcare literature. At the end of talk, the audience will learn to avoid some of the common mistakes in the design, analysis, presentation and interpretation of healthcare data.